A powerful HR transformation is on the way with an increased focus on employee performance. There isn’t any organization that can attain productive results without a high-performing workforce. Is declining productivity a concern for you? If so, then it’s high time that you take actionable steps to boost your employees’ morale. Organizational productivity cannot be evaluated by the number of employees working for you for a long time. It is more about employee engagement and satisfaction level. It is significantly important to understand how your employees react in different situations and their approach towards a specific task assigned. Only then you will be able to boost their performance and morale. Don’t ever use a one-size-fits all approach to improve employees’ performance. A well-tailored approach encompassing best HR practices as per employees’ need can keep them engaged and satisfied. A customizable HR tool can serve this purpose in an effective manner. Organizational Alignment: Make use of customizable organization alignment tool to align different employees, teams and divisions with the key objectives of the organization. This serves as a competitive asset to double your workforce’s engagement while enabling better decision making. The alignment and overall productivity of your business drastically improve by perfectly articulating employees’ roles and responsibilities. Moreover, performance rating becomes more rational while offering new opportunities to grow. Transparency: Modern HR management systems gives employees a transparent outlook to all the related processes. Whether it is self-evaluation, self-development plans or rewards and recognitions, employee can access all the relevant information in minutes. More transparency implies less confusion that in turn improves employees’ performance. Constant Appreciation: Never miss a chance to appreciate your employees. A simple ‘Thank-you’ or ‘Well-done’ note is enough to boost employee performance. There is no doubt, regular appreciation and constructive feedback encourage employees to do better. There can be nothing better than having an option in an automated HR system to personally appreciate efforts of a team member. With the help of amazing features (like comment assist/ notes), managers and HR can conveniently convey their appreciation to employees. Flexibility: Whether it is about working hours or compensation, flexibility is what every employee admires. 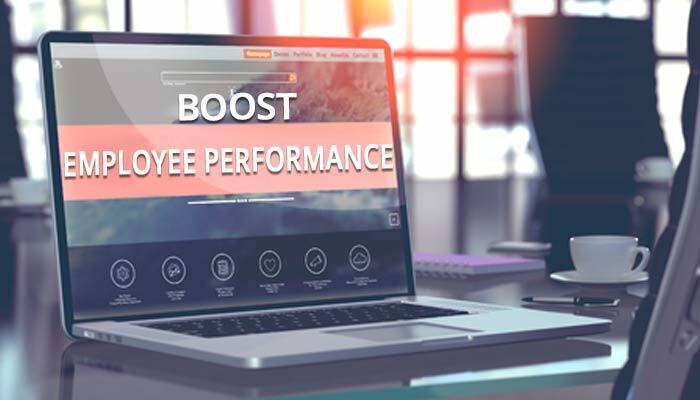 Align variable compensation plans with quantifiable employee performance to motivate your employees to deliver exceptional results every time. Allow them to manage and regularize their attendance. You will see a dramatic improvement in their performance over the time. Regular Feedback: Majority of HR tools support 360-review module to capture inputs from multiple stakeholder simultaneously. You can conduct such reviews in an anonymous manner too. Such comprehensive feedbacks empower employees to determine their performance gaps and improve accordingly. This will help your employees to gain insights on their development needs as well. Training Management: Manage your employees’ training related needs with a single online performance management software. It will allow you to map competency gaps, identify the areas of improvement, allocate the right training programs and capture the training outcomes. Increased emphasis on employees’ training and development will hone their skills and encourage them to perform better. Satisfaction: Last but definitely not the least, employee satisfaction counts for improved performance. Conduct employee satisfaction survey to ensure that your employees’ voices are heard. This will help you to know what exactly your employees want and in turn what initiatives are required from your side. It is one of the finest way to connect with your workforce, promoting employee engagement and increasing their level of satisfaction. Moreover, you can eradicate your employees’ concerns that may have restricted their performance. Encourage the use of above mentioned practices to boost employee performance in your organization. Analyze your current HR system and identify upgradation or replacement needs for quick resolution.